More than 600 Bauer grads will be recognized on May 14 during a convocation ceremony, held at NRG Stadium. 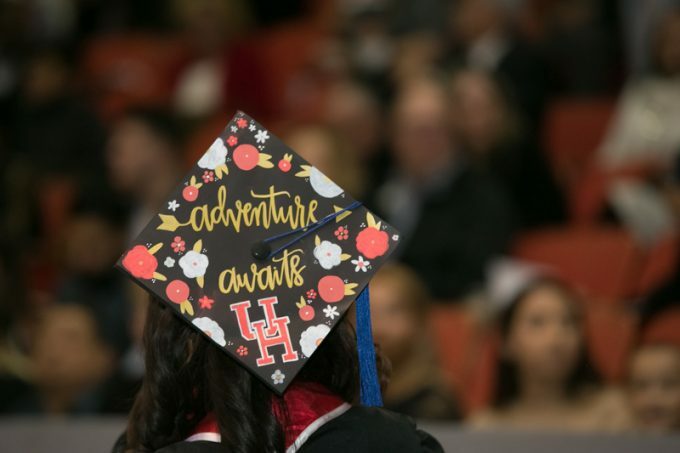 The C. T. Bauer College of Business at the University of Houston will recognize more than 600 graduating students at its Spring 2017 Convocation on May 14, featuring a keynote address from Chairman, President and CEO of Southcross Holdings and Southcross Energy Companies Bruce Williamson (MBA ’95). This semester’s graduating class includes candidates for bachelor of business administration degrees, as well as those completing graduate (MBA, Executive MBA and MS) and doctoral business programs. In addition, Bauer College Dean Latha Ramchand will acknowledge three undergraduate students who have achieved a perfect 4.0 grade point average during their studies, as well as 10 graduate students who have been named Outstanding Student in their respective programs. You can follow the conversation on Bauer’s social media channels throughout the evening on Facebook, Instagram, Twitter and Snapchat, by using #BauerGrad17. The university will also livestream the ceremony (click here for more information on the telecast). For more information about the Bauer College Spring 2017 Convocation, visit www.bauer.uh.edu/commencement.